Costain was awarded an Early Contractor Involvement (ECI) contract for the dualling of the Gilwern to Brynmawr section of the A465 Heads of the Valleys Road, expected to cost about £220m. However, in autumn 2017 the Welsh Government announced that the scheme was taking longer than expected, the projected cost had risen by 23% and it was in dispute with Costain over liability for the cost increase. Last week the Welsh Government admitted there had been a further increase of £54.9m in the projected cost, which now stands at £336.2m. The news comes on top of major cost increases for the first two sections of the scheme, which have been completed. The sections came in a combined £42m over budget and many months late. There are six sections in total. The Welsh Government also confirmed that the Costain dispute has not been resolved and the dualling work would not be completed until next year. Previously a revised opening date had been set for late 2019. He said that ECI had been implemented on a number of major trunk road projects in Wales in recent years. ‘The ECI contract involves the appointment of an integrated design and delivery team early in the development stage of the project and that whole team then taking it through outline design development, statutory process and then onto detailed design and construction,' he added. He also shed more light on the difficulties engineers have encountered in widening the alignment through the rocky Clydach Gorge. ‘The project has experienced delays and cost increases due to difficulties experienced on site. Costain has highlighted that the primary reason for this is due to a complex construction solution required to address the geological feature that they have discovered in one particular location along the scheme. The solution required will impact on the construction costs and programme. The decision to dual the A465 from Abergavenny to Hirwaun was taken in 1995 by Conservative MP John Redwood, then secretary of state for Wales. The cost of the whole programme was estimated at £268m in 2000. This estimate more than doubled to £763m in November 2009, taking account of construction price inflation and changes in design standards. 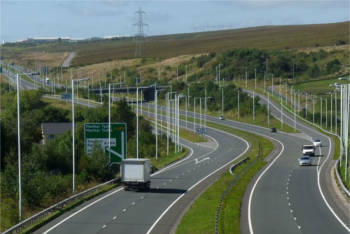 The 2009 estimate included £256m for dualling the final single-carriageway section, from Dowlais Top to Hirwaun. In July, the Government sought expressions of interest from companies for this scheme, estimating the total value at £500m. The WAO reported in 2011 that dualling of the first two sections, Abergavenny to Gilwern and Tredegar to Dowlais Top, finished late and cost more than expected. Problems with the first A465 dualling scheme included a £2.2m cost increase after the site of a newly demolished petrol station was found to be contaminated. The final cost was £57m, more than double the £26m forecast. The works finished over a year late. In the second scheme, residents and businesses in the Tafarnaubach area protested over the planned demolition of local road bridges. Two temporary bridges were installed. The scheme cost £11m more than forecast and finished four months late. The current scheme has disrupted traffic for almost four years. Last year Stagecoach reduced bus services in the area because 'unpredictable lengthy delays' on the A465 were disrupting scheduled timetables. Bus operators can be fined if services repeatedly run more than five minutes late.